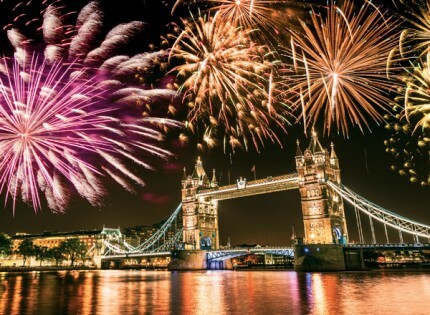 The midnight sky above the iconic Tower Bridge is lit up with beautiful striking fireworks as the celebrations for the New Year take place. Tower Bridge is a London themed personalised Christmas card which is suitable for corporate, business, personal and company use. CN0047 is suitable for small - large companies. Tower Bridge is finished with gloss and is supplied flat.